Travelers Woods of New England was a nice little Passport America campground just north of Deerfield. I was able to fill my propane here and Thistle appreciated the AC while I went to tour the town. Thistle also enjoyed wading and drinking in the Fall River. Entering Old Main Street in Historic Deerfield. Most well known for the series of Indian attacks and kidnappings during the French and Indian War. Main Street is lined with historic homes, some of which are open for public tours. There was a big shady parking area behind the fire station. Your ticket gives you access to the buildings and guided tours. So the first stop was the Visitor Center to get a map and ticket. Across from the Visitor's Center is the Deerfield Inn, circa 1884. It has 24 guest rooms, a restaurant and tavern. The First Church of Deerfield. 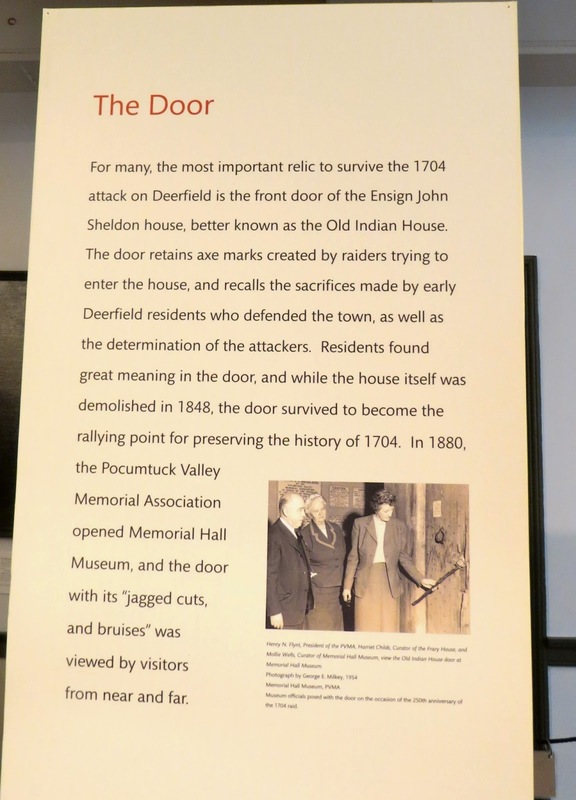 I passed this historical marker which reminds me that 1704 was not the first attack on Deerfield. A lot of the homes along Main Street belong to Deerfield Academy, an exclusive college prep boarding school. The homes are used to house students and faculty. Looking across the street at the Administrative Offices of Deerfield Academy. The Frary House, c. 1760. I came back to tour this home, but no photos were allowed inside. The Wells-Thorn House was built in 1747, and first painted blue in 1802. The blue was really out-of-place compared to the rest of the houses along the street. 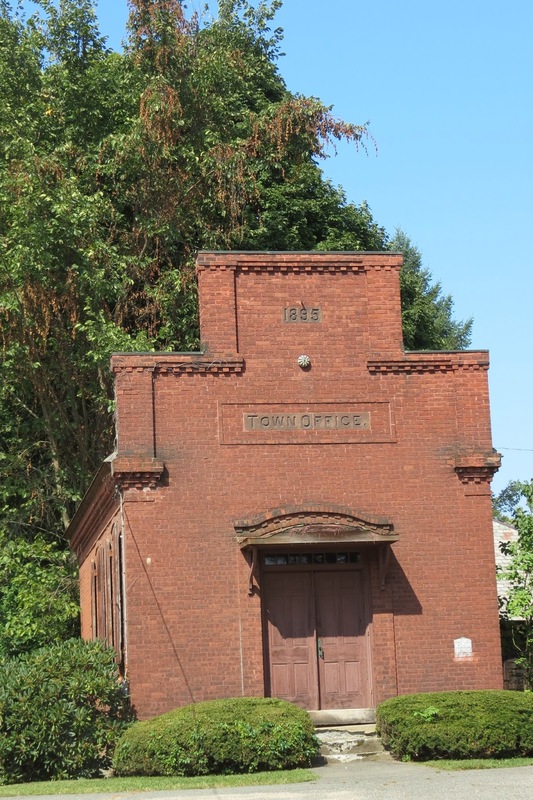 The old 1835 Town Office building belongs to Deerfield Academy. Outside the Memorial Hall Museum, one of America's oldest museums. It has many collections which I did not take time to see...another visit perhaps. These "scarecrow" Colonial era workers lined the walkway to the entrance. 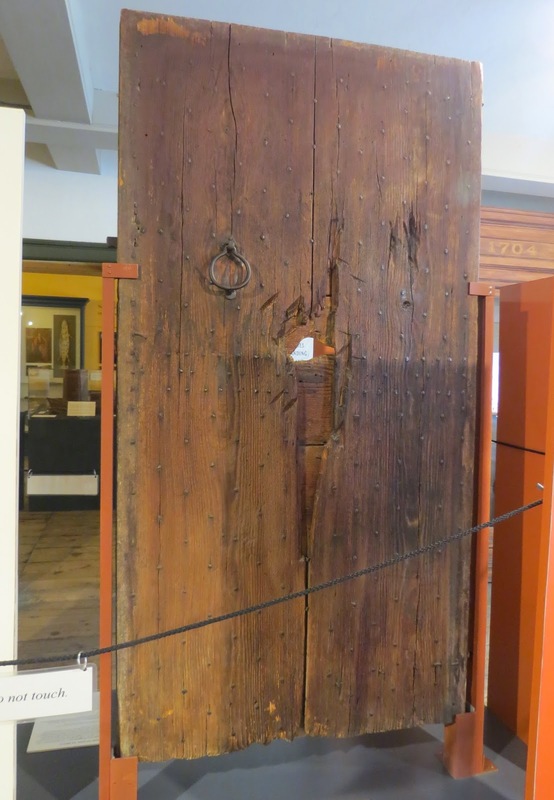 Perhaps the most important item in the museum is the original door of the Sheldon house, with the axe holes made by attacking Indians. Attackers chopped the hole in the door, then inserted a musket and fired, killing John Sheldon's wife, Hannah. One child was also killed in the attack. 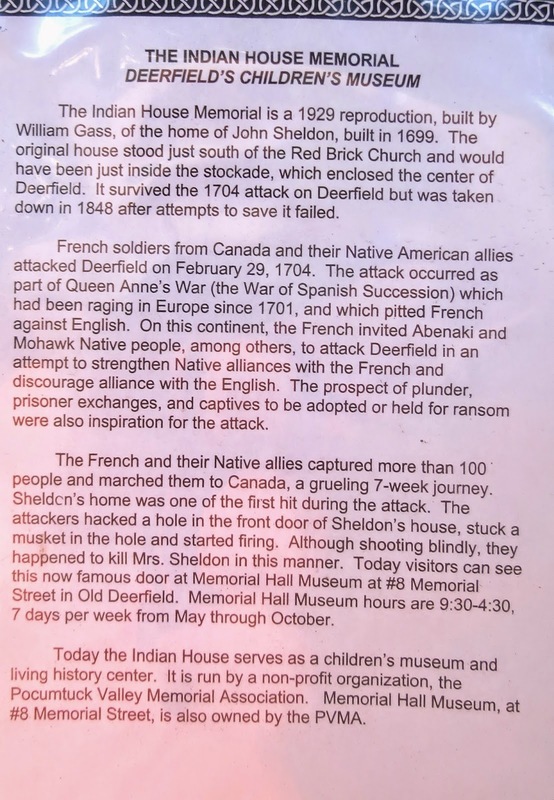 Four other children were taken captive by the French and Indians. The house survived, but was later torn down, with only the front door preserved. 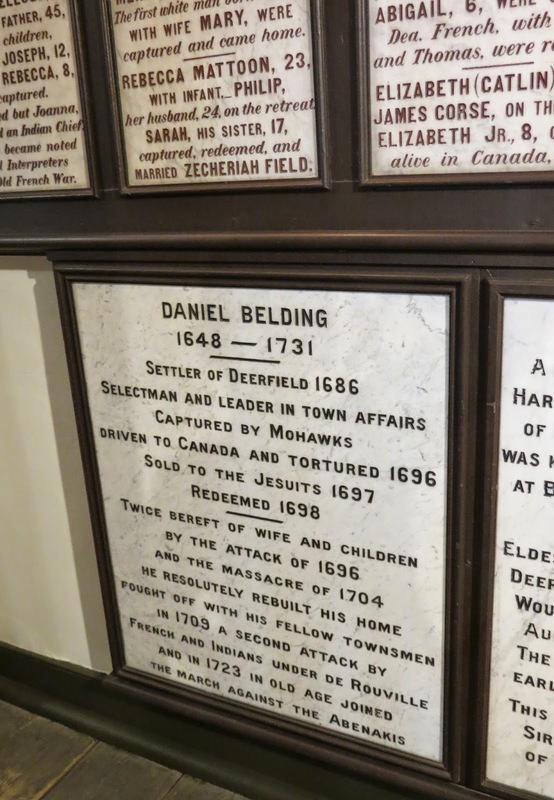 Memorial plaques line the wall in the 1704 room of the museum. A relic from a previous attack in Hatfield...a chil's shoe. Students were arriving at Deerfield Academy. This Registration sign is the only indication there is a school here. The Academy stands within the area of the 1704 stockade. 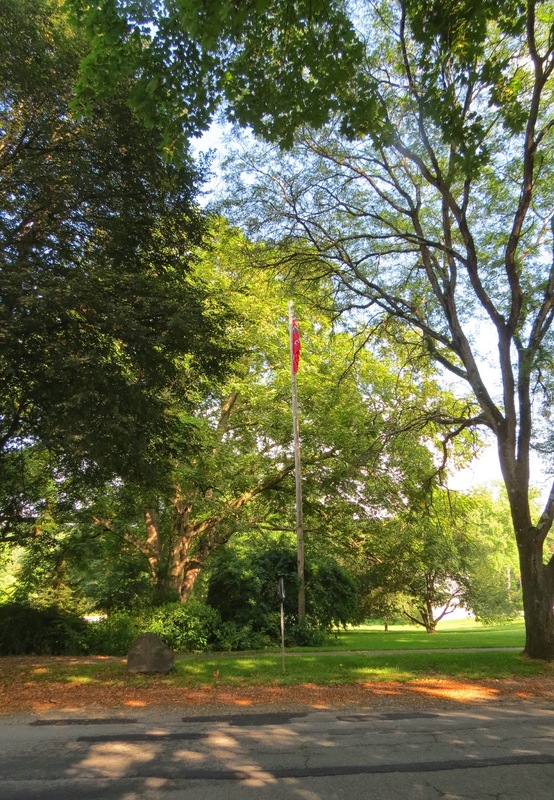 Near the Administration building is the site of the John Sheldon house, referred to as the "Old Indian House." Leaves are just beginning to turn here...the most colorful ones are on the ground. Down the street a replica of the Old Indian house was built in 1929 as a memorial of the 1704 attack. It houses a children's museum today. Continuing my tour, I pass more buildings belonging to the Academy. 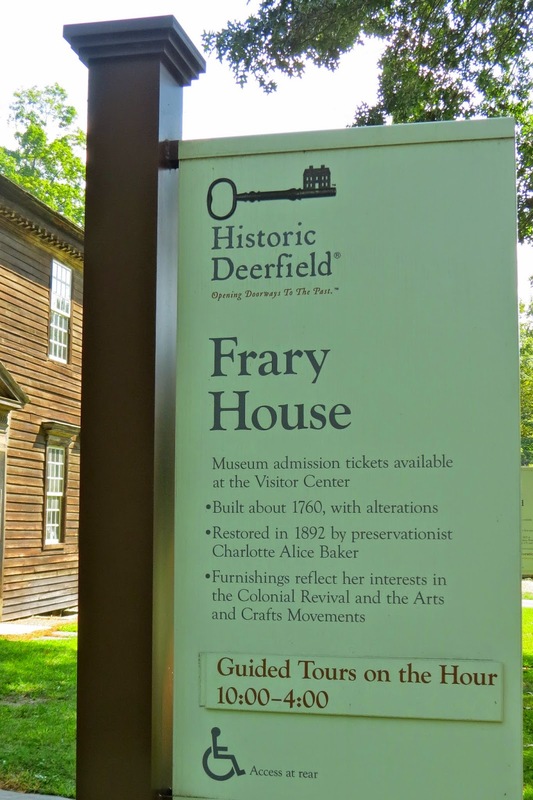 This house, built in the 1750s now houses an Apprentice's Workshop....a hands-on activity center featuring architectural woodworking, English ceramics, and woven wool textiles. 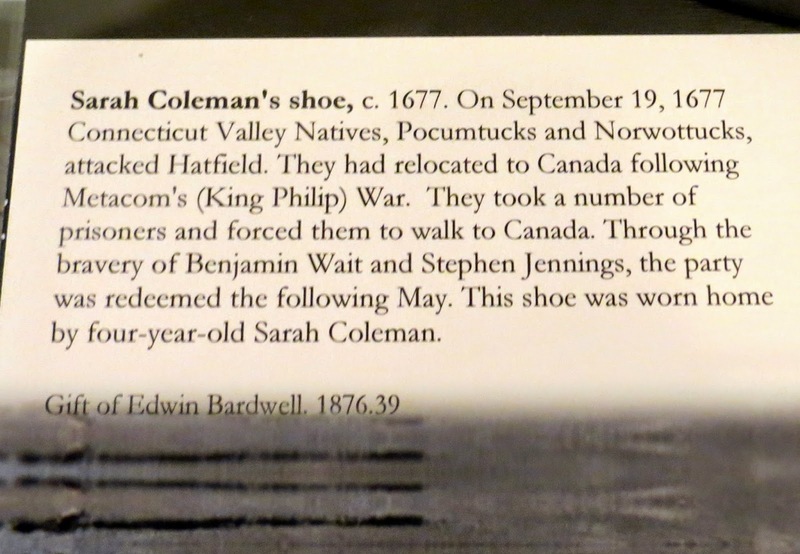 My next stop was the Flynt Center of Early New England Life...an assortment of special collections. 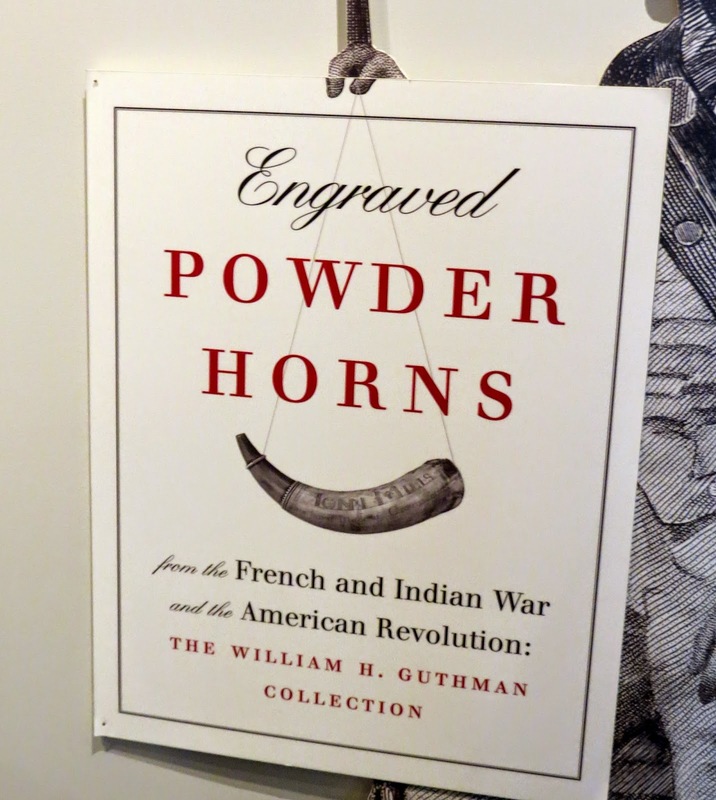 I was interested in seeing the Powder Horn collection. This one had a drawing of Fort William Henry with even the staircase showing inside the barracks. In the textile collection there were samples of embroidery similar to what I saw in the Frary House, but was not allowed to photograph. 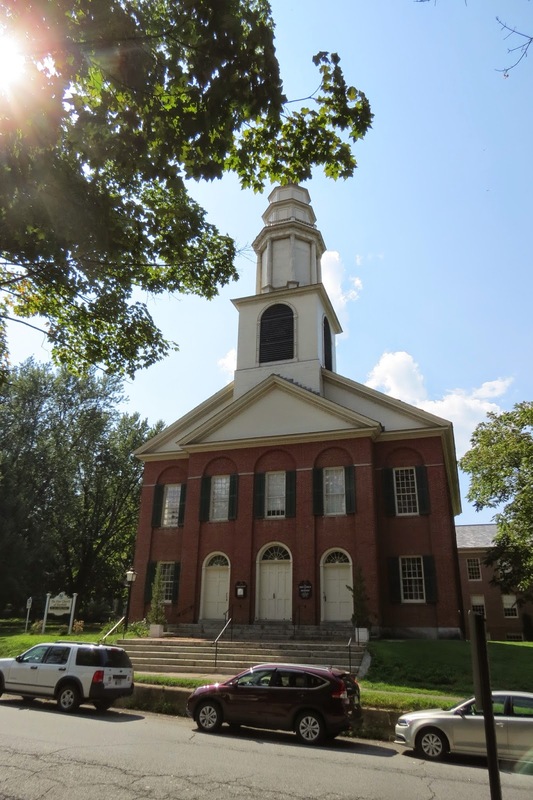 Walking back by the church, I learned it was the fifth meeting house of the congregation that was founded in 1688. 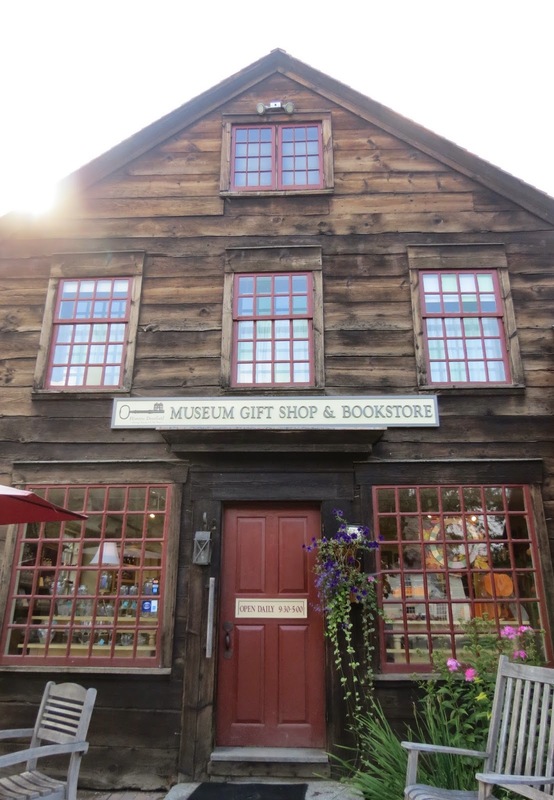 This building was built in 1824. Next to it is the Post Office which is a replica of the third meeting house which served from 1696-1728. This would have been the meeting house at the time of the 1704 massacre. Uh-oh, a bookstore...I could get in trouble here. I came away with two...based on historical accounts, but written in the style of historical novels. Bicycles with fat tires are for rent. I walked. I toured this house...the Stebbens house, Deerfield's first brick house, built in 1799. Snuck an inside photo. The house is furnished in the Federal period style. The circular staircase had mural wallpaper, popular during that period. 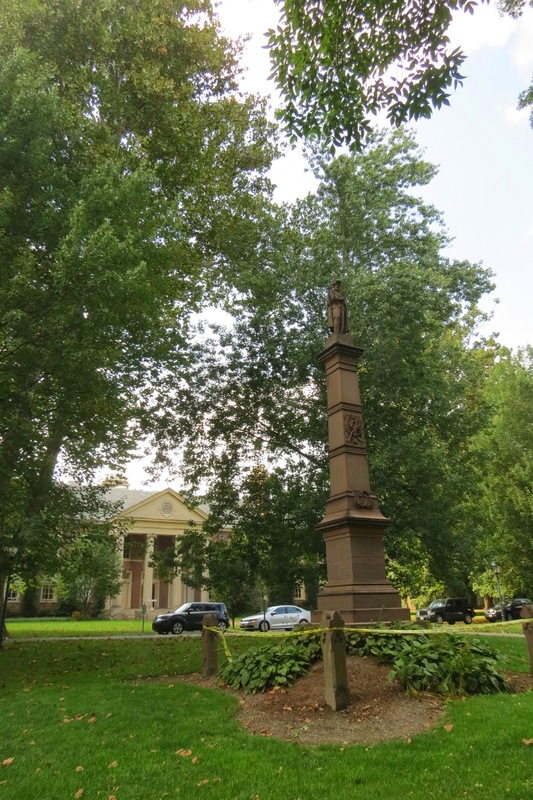 The Liberty Pole was erected on July 29, 1776. A footpath leads to the river. It leads past a working dairy farm. I didn't go all the way to the river because the trail closes at 4:30, and it was 4:30. I did see one of the farm animals...not dairy. Back on Main Street, The 1848 Rev. Moors House is undergoing restoration. 1817 Williams House, household of prosperous village residents. Sheldon House, built in 1755, furnished to reflect the life of a farming family. Ashley House, built in 1734 with alterations, home of Deerfield's second minister. 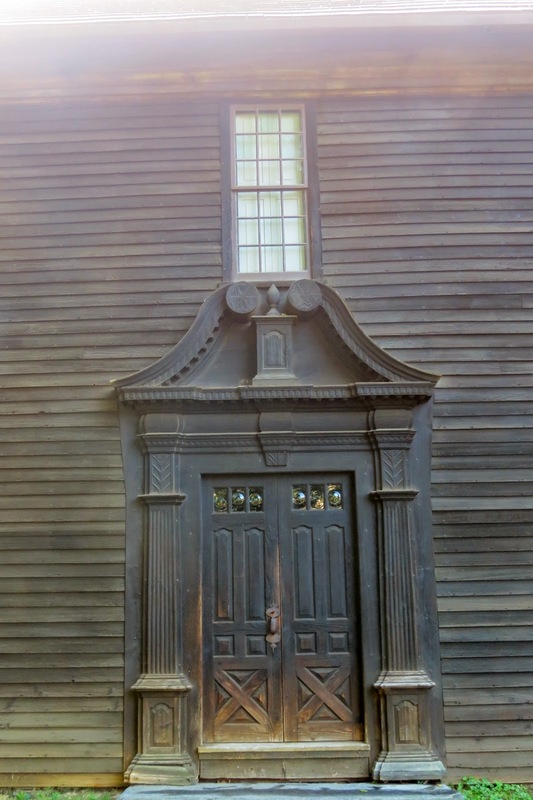 Front door of the Ashley House. This building houses a silver and metalware collection. Another view of the 1734 Allen House. Another private boarding school, for grades K-9. Many homes were burned during the attack in 1704. 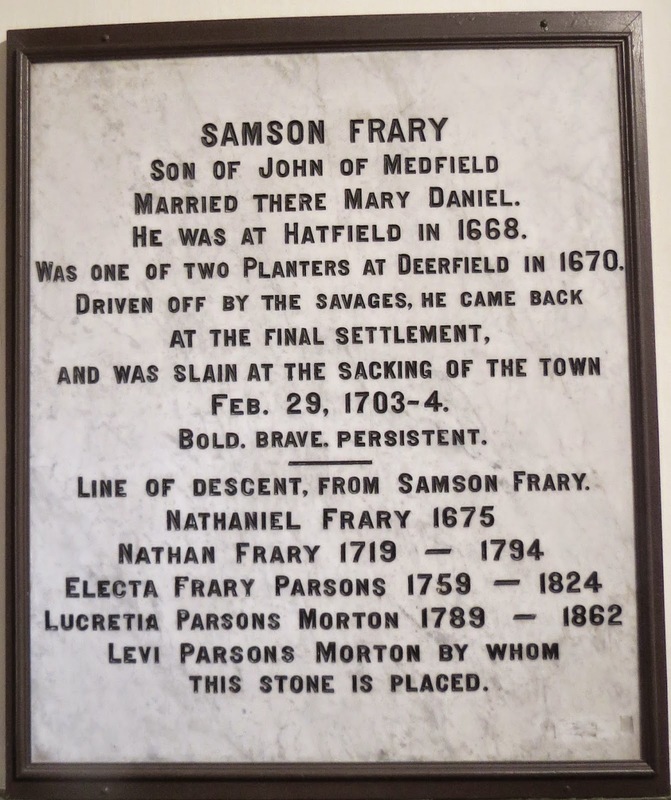 Some captives were rescued or ransomed and returned to Deerfield. Others, especially children were adopted into Indian or French families, and did not return. It was a quick tour and worthy of a longer visit.